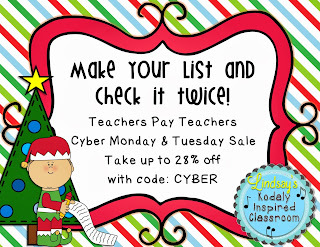 Today is the last day of the TPT Cyber Monday and Tuesday Sale. If you have anything you want to get, I'd definitely stock up today! Most of my store (as well as many other teachers' stores) is up to 28% off when you enter the code CYBER at checkout. I've created lots of new materials for Winter and Christmas, and just added another to my store yesterday. 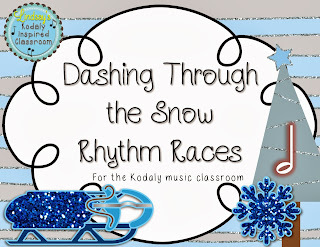 It is called "Dashing Through the Snow Rhythm Races". It has nothing to do with "Jingle Bells". It is just a fun rhythm practice game. Originally I wanted it to be Bobsled Rhythm Races, but I could not find any bobseld clipart that met my needs. This game is played just like my Turkey Trot or Candy Corn rhythm races where you have different colored teams and each team gets a pile of rhythms. When you say/play the rhythm, one person from each team races down to find the correct rhythm and bring it back for their team. My idea with the bobsled (sleds in this case) is that if your PE teachers has scooters, you could have them race on scooters to find the rhythms. This works well on a combined PE and music day or if you have the space in your music room and can borrow scooters from your PE teacher. 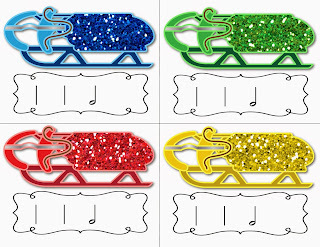 Although I couldn't find bobsled clip art, I do love these glittery sleds. They were one of my first Cyber Monday purchases from Glitter Meets Glue Designs. She is the queen of all things glittery! 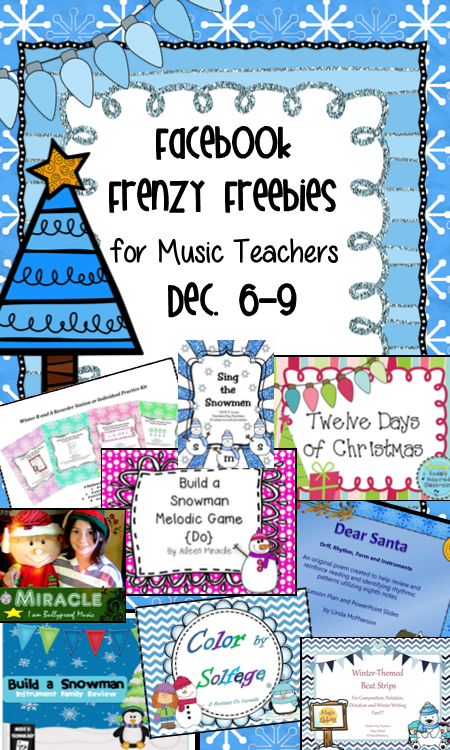 I also wanted to let you know that I will be participating in a Facebook Frenzy this weekend for music teachers. 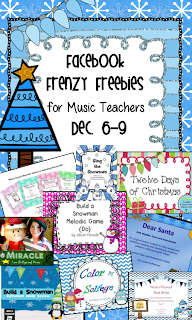 16 music teachers including myself are teaming up to bring you 16 fabulous freebies. Starting Dec. 6th, if you visit any of our facebook pages and "like" our page you will be rewarded with a freebie as our thank you for following us. Once you have downloaded the freebie from one teacher there will be a link to the next freebie so you can hop through and collect all 16 free things for your music room. HOW AWESOME DOES THAT SOUND!?! I am so excited that many other Kodaly and Orff teachers are a part of this frenzy. There will truly be something for everyone. Here's a little preview of my freebie and the other great freebies to come! I have been saving this just for my facebook frenzy! It is not currently available in my TPT store. Head to my facebook page Dec. 6-9 to start snagging your freebies and don't forget about the CYBER sale ending today!